After working separately on some large scale projects Edgar Wright and Simon Pegg reunite to create another familiar British version of an American dominated genre. Years after a group of friends attempt to finish the “golden mile”, Gary King (Pegg), a man who has yet to grow up, persuades them to return to their home town of Newton Haven to complete the pub crawl to end all pub crawls. When they arrive they find out that their hometown is not how they left it. Now that Wright and Pegg are both in the region of forty their characters are reflecting on years gone by rather than living in the now which brings a difference to how the character behave and interact with each other. Interestingly most of the group are settled with partners and content with life whereas Gary King seems to continually looking back and at his favourite years. This is a new addition to the franchise as well as King’s entertaining self destructive attitude. Pegg and Wright’s writing ability has really improved from the previous films especially in creating a character that is liked despite so many off-putting flaws. Standing out from the crowd is Nick Frost who plays Andy; this is the first time in the franchise that his character is more authoritative than Pegg’s which along with his onscreen presence gives the impression he controls the film like a lead character. One downside is that he only starts to narrate the film towards the end; having this narration throughout would have brought an epic tone to the film that could have added heightened action and more opportunities for comedy. New to the Cornetto Trilogy is actor Eddie Marsan who plays car dealer Peter. He fits into the ensemble of actors with ease and gives a performance that neither steals the limelight nor is forgettable. When attention is drawn to other members of the group he manages to keep his character in focus most often by being critical of others while keeping meekly apologetic. 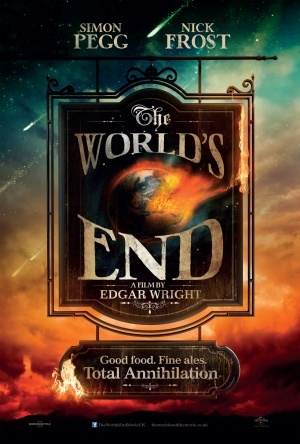 The World’s End provides a strong finish to this collection with everything expected from a Cornetto movie: truthfulness to the genre, comedy coming naturally from situations and a core of true friendship.